With zero fanfare Google unleashed a site called "What Do You Love?" that functions as both a way for you to explore things of interest to you from kittens, crab cakes, to Chicago while at the same time promoting Google services. It's well-designed and an efficient discovery engine that turns simple search terms into opportunities to experiment with Google's expansive portfolio of products -- some of which you may have never seen before such as Google Moderator. The site feels a tad clunky and is in beta. Searching for "cheeseburgers" offered curious option such as "scour the earth for cheeseburgers", "plan your next cheeseburger event", and "Make a photo album about cheeseburgers" where Google offers a suggest started picture of an inebriated David Hasselhoff slumped over eating a cheeseburger. What Do You Love is a mash up of Google's services, including Maps, SketchUp, Patent Search, Photos, Books, Translation, and more. Some services, like Gmail and Google Voice, don't change much depending on your search term. When you search "fluffy kittens," for instance, Google Voice tells you to "call someone about fluffy kittens" and Gmail says "email someone about fluffy kittens." 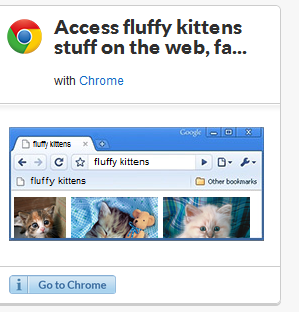 The way the Web works now, nobody needs yet another email or breathless VoIP call about fluffy kittens. Some users have experienced error pages saying that Google WDYL has "overextended its quota." As of now, What Do You Love is little more than a polished instrument for Google's self-promotion, especially because WDYL doesn't handle "complex" searches as well as Google's main page does. But it's also cute as hell and might sponge up some of the time you'd ordinarily waste on Facebook today.